Attribution, publisher transparency, behaviour, and segmentation are all key features. Retargeting is often seen as a quick win when it comes to digital marketing; simply re-engage with people who didn’t convert and optimise accordingly. With the 5 tips below, you’ll be able to drive more efficiency and growth from your retargeting activity. Retargeting has become one of the most popular forms of display advertising since it gives the opportunity to reach prospects or customers who have already interacted with your brand to persuade them to buy after they have left your site. To gain a true view of the performance of your retargeting activity, you must measure it within an analytics or attribution tool. This will allow you to see the role the channel plays within the full customer journey. If you only measure the revenue driven by retargeting within the retargeting tool itself, it’s highly likely that you will be double counting sales through other digital marketing channels and tools. This not only means the data is inaccurate but it could also mean that you over invest in that channel and activity. 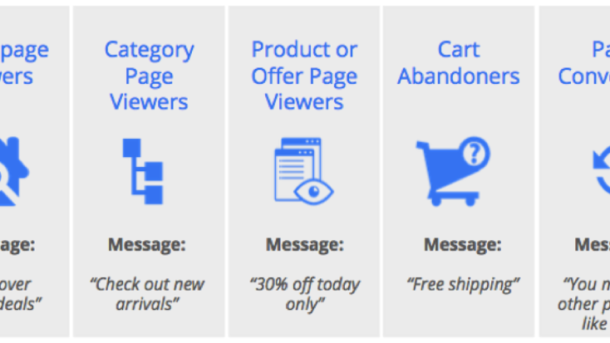 If one of your customers is exposed to all four of these channels, it could be that all four of the tags are dropped onto their browser. If a sale is made for £40, all of the channels could claim that sale. By using attribution, you gain a clear view of how the various channels interact with one another. The £40 value of the sale will also be shared across all channels involved in the journey. It’s also important to consider the various attribution models when determining the success of your campaign. Due to the nature of display retargeting, it will typically sit towards the end of the customer journey therefore, a last click model will over value display retargeting. It’s recommended that you use a retargeting tool that gives you full visibility into the sites your ads appear on. The first benefit of this transparency is for brand protection. Many tools will give you the opportunity to not appear against sites or content that contain adult content or have inappropriate or offensive content. It is, however, important to ensure that sites can be excluded that are not relevant to your product offering or your brand guidelines. I currently work for Gymshark who sell performance fitness clothing. It would not be relevant or be appropriate for the brand if our retargeting ads were to appear against an article about junk food or an article that expresses a negative view on the health and fitness industry. This is great inspiration for display prospecting as well as other upper funnel activity. Certain tools may not allow you to target users based on their specific on-site behaviour or audience signals such as their interests and other products they may be in market for. The old marketing saying around “right message at the right time” should always be considered. Relevancy is key; It’s not good enough to simply spam everyone who has been to your site in the past. All of these factors will impact how much you’re willing to bid plus the creative and landing page you’ll use. Certain behaviours may also be used as a negative audience. For example, you may not want to retarget at all to someone who visited your site and bounced. Potential customers do not want to feel as though they’re being followed around online with the same product they viewed. The customer may love the product, and there could be other reasons why they didn’t complete the transaction. Many advertisers will only use product feed ad formats for retargeting. There is a huge opportunity to use other creatives and messaging to help drive the conversion. For example, a voucher code may help convert the sale or a free delivery offer. It’s also important to consider the frequency your ads are shown. Certain tools and partners may not limit the number of times your ad appears to a user. They may often tell you that the algorithm is calculating the optimum rate of impressions. Always push back on this. High volumes of impressions can be off putting to customers and potentially cause them to block your ads completely. 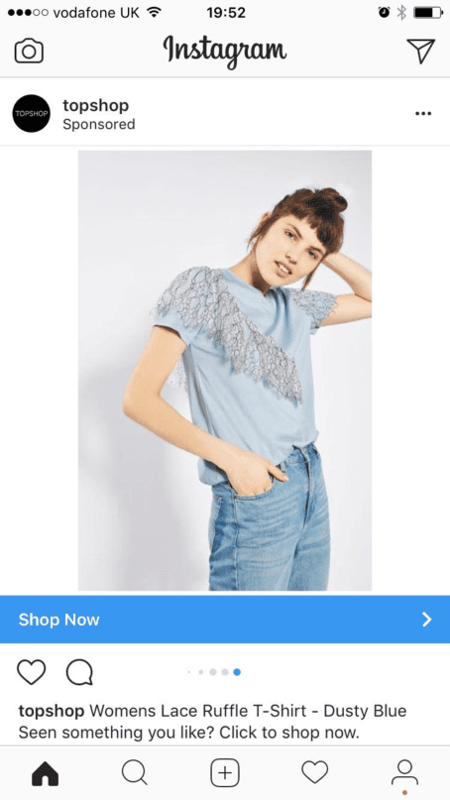 In this Topshop example, I was retargeted with a selection of products on Instagram a day after visiting their site and making a purchase of 2 pairs of jeans. I was targeted with a lot of t-shirts which I see as a positive as they could have all complimented the jeans I bought the previous day. They were relevant in this sense. On clicking through to the website I can see the t-shirt is just £5 and there is only a size 6 and 8 in stock. I am a size 10 which they could have seen from my purchase. 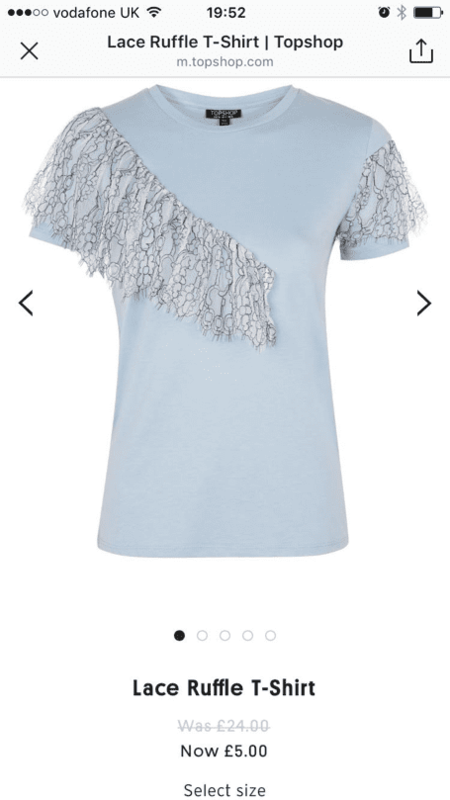 The low value of the t-shirt could have also meant that Topshop will make a low return for the Instagram activity. Retargeting can be a great method for driving customers back to your site as long as the message is relevant and the activity is being measured accurately. A one size fits all approach can drive sales through remarketing, however incremental growth and efficiency can be achieved when the targeting and message is appropriate and engaging to the end customer. Thanks to Amy Bott for sharing their advice and opinion in this post. Amy has been the marketing director at Gymshark since March 2017. Prior to that she worked at VictoriaPlum.com as head of digital marketing. For the first six years of Amy’s career she worked agency side, managing PPC & affiliate campaigns for global clients including Microsoft, Opodo, Gap, First Choice & Body Shop. Amy also recently completed the IDM Postgraduate Diploma in Digital Marketing. A hands-on marketer, Amy has an enthusiasm for analysing data & forming strategic plans to deliver outstanding ROI. You can find Amy on LinkedIn.